(ca. 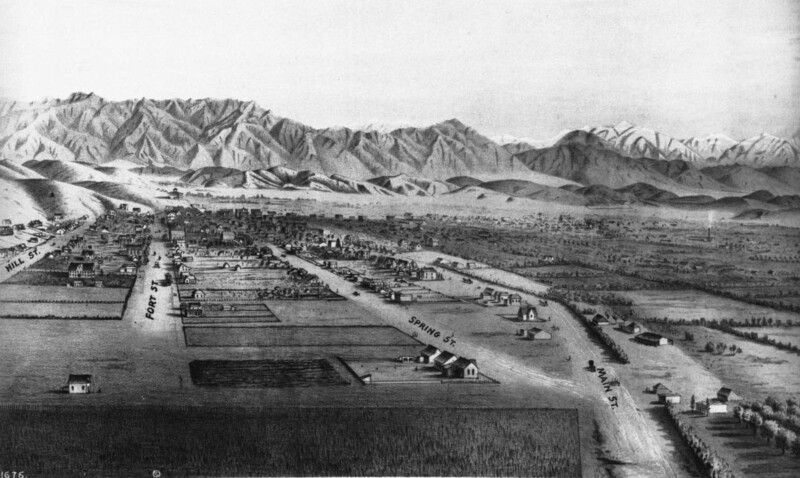 1873)^^ – Panoramic sketch looking north toward downtown Los Angeles showing mostly undeveloped land. At lower-right can be seen the junction of Main and Spring streets at a point where 9th Street will one day intersect. Hill Street and Fort Street (later Broadway) are on the left. The Verdugo Hills and snow-capped San Gabriel Mountains can be seen in the distance. Photo of a lithograph, courtesy of the California Historical Society. (ca. 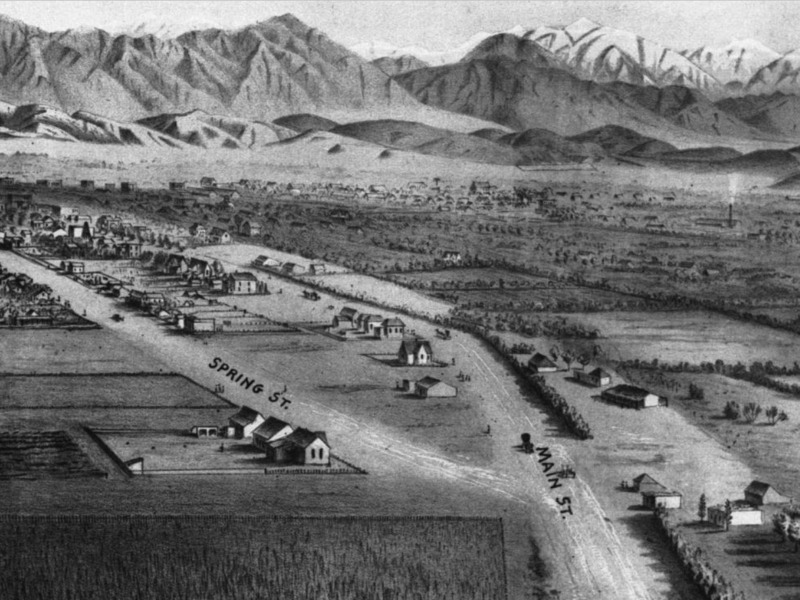 1873)^^ – Detail view showing the intersection of Main and Spring streets as it appeared in the late 1800s. Most of the land east of Main Street between 6th and 9th Street was owned by Ozro W. Childs. Childs obtained the contract to build an extension of the Zanja Madre, a canal system to bring water to the fields south of the pueblo. He was paid in land in that area – all now within present day Downtown Los Angeles - from 6th to 9th, and Main to Figueroa Street. This property was the foundation of his fortune. He built a substantial house at 10th and Main, then a half-mile from town center, and on his property took up planting. In his day, Ozro Childs was Los Angeles’s most prominent plantsman, with a Plant nursery. 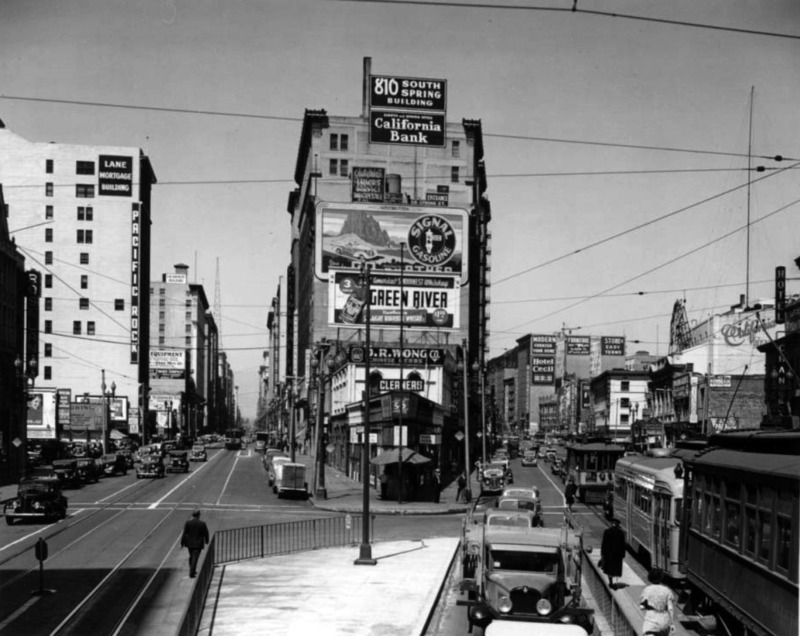 (1917)^^- Looking north up Spring Street (left) and Main Street (right) from 9th Street in downtown Los Angeles. The Argyle Hotel can be seen at lower-right. Cars and streetcars begin to share the streets at this complex intersection. 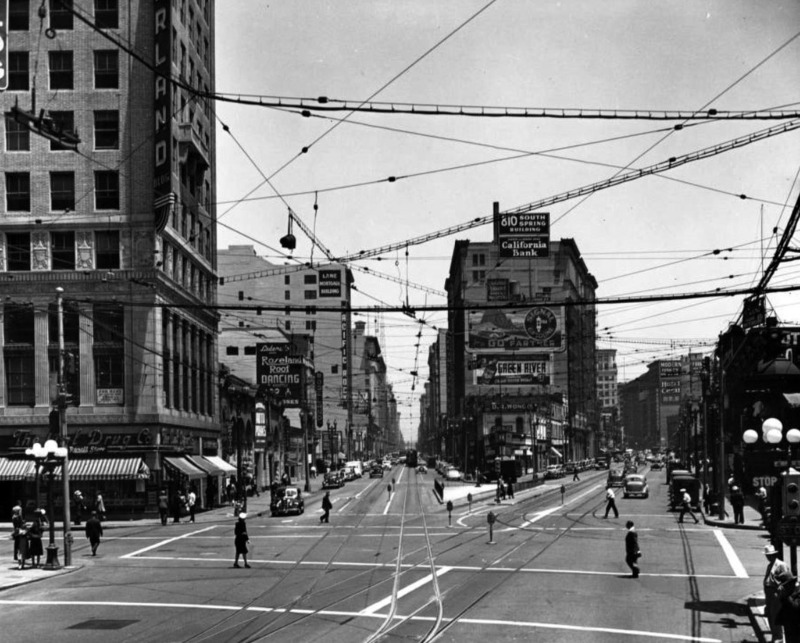 Because of its unique shape, the intersection of Main, Spring and 9th streets would become over the years one of the most phototgraphed intersection in downtown Los Angeles. (1920)* – Street view looking north showing trolley tracks in the street splitting at 9th, just like the street which splits into Spring (going left of the center island) and Main (going right). (ca. 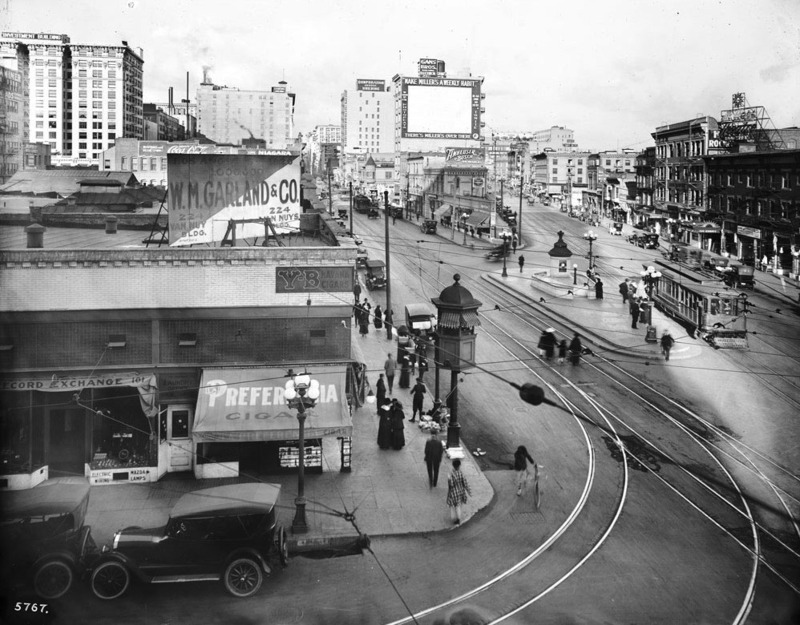 1920)^^ - View looking north from 9th Street showing Main Street and Spring Street beginning to span outward creating a triangular shaped block (center). There is a fountain in the island situated in the middle of the large multi-directional intersection. Trolley, and tracks of the Los Angeles Yellow Car streetcars are seen in the pavement. Note the elevated kiosk on the NW conrer of 9th and Spring streets. 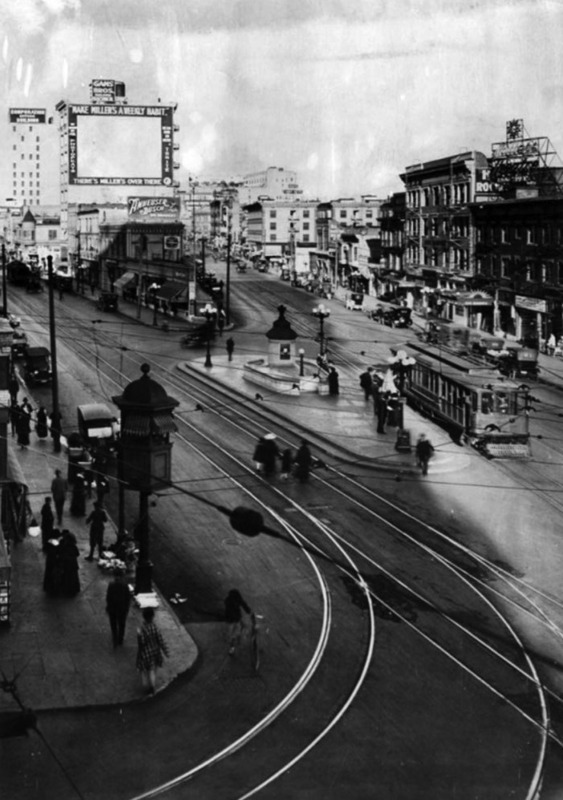 In the early part of the 1900s, elevated booths as seen above were used by the Los Angeles Railway and the Yellow Cars as a switchman’s tower to control the flow and path of streetcars through the intersection. Click HERE to see a map of the Los Angeles Railway System (Includes: LARy/Yellow Cars, PERy/Red Cars, LA Inter-Urban, LA Pacific R.R., and the LA & Redondo Ry). (ca. 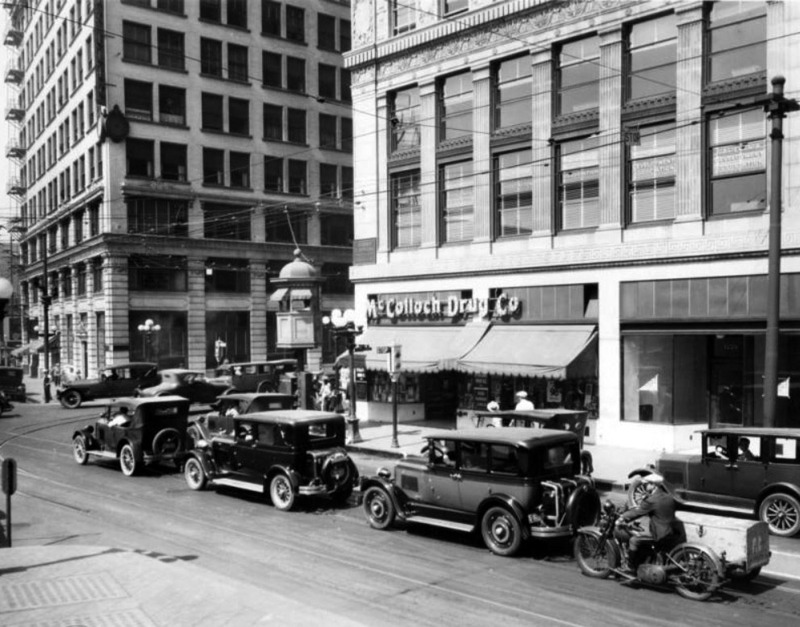 1925)* - Several cars and a motorcyclist wait for their turn to cross the intersection of 9th and Main streets. A traffic control booth is perched above the street on the corner, with a man at the helm changing the traffic signals. McColloch Drug Co. is open for business offering a soda fountain as well as lunch. Take a closer look at the motorcycle in the lower-right. The sidecar looks suspiciously like a coffin. 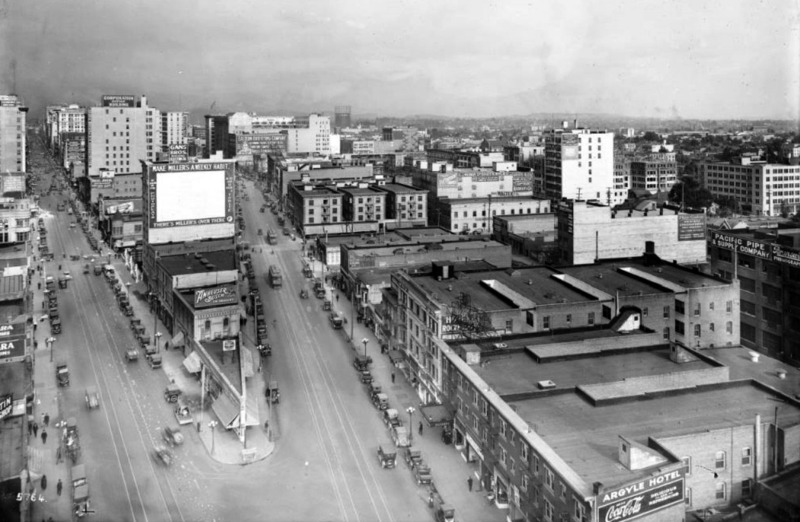 (1930)* - Looking north from 9th Street where Spring Street (left) and Main Street (right) split with elevated kiosk on the NW conrer. The streets are shown bustling with the activity of pedestrians, automobiles and streetcars. The raised kiosk was manned with an operator who would control the traffic signal and help with the flow of traffic at the complex intersection. (ca. 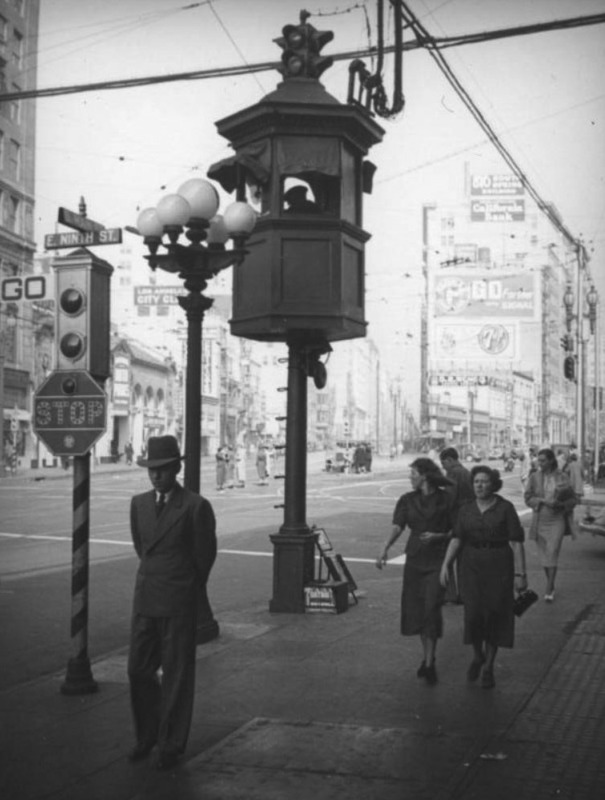 1937)* - Close-up view of the kiosk on the conrer of 9th, Spring and Mains streets. A uniformed man sits in a booth on top of a pole in the foreground of this corner as pedestrians walk by underneath. Also note traffic signal with semaphore arms. 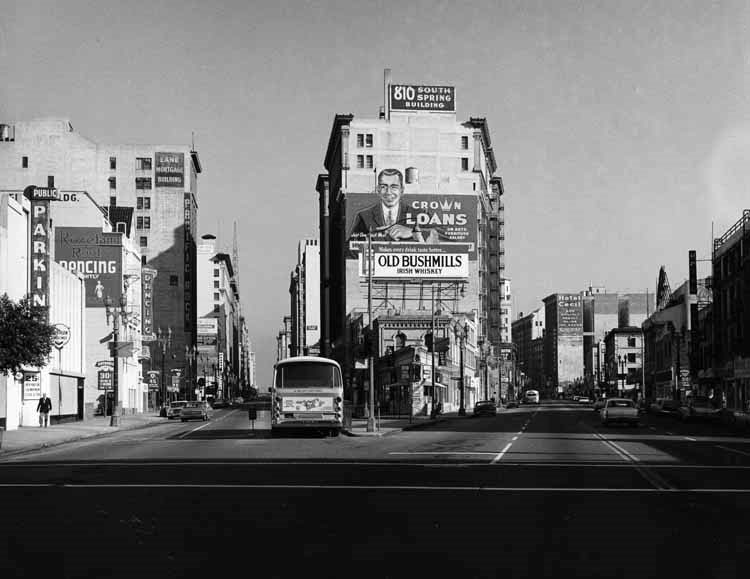 Signs visible in the background include the Los Angeles City Club (833 South Spring) and the California Bank in the 810 South Spring Building. 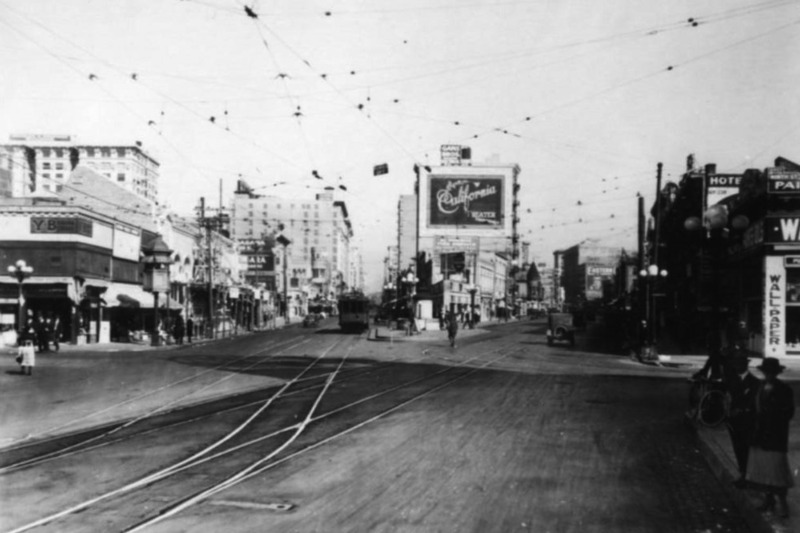 To get cars and commerce moving through the downtown business district, Los Angeles installed its first automated traffic signals in October 1920. These early signals, manufactured by the Acme Traffic Signal Co., paired “Stop” and “Go” semaphore arms with small red and green lights. Bells played the role of today’s amber or yellow lights, ringing when the flags changed—a process that took five seconds. 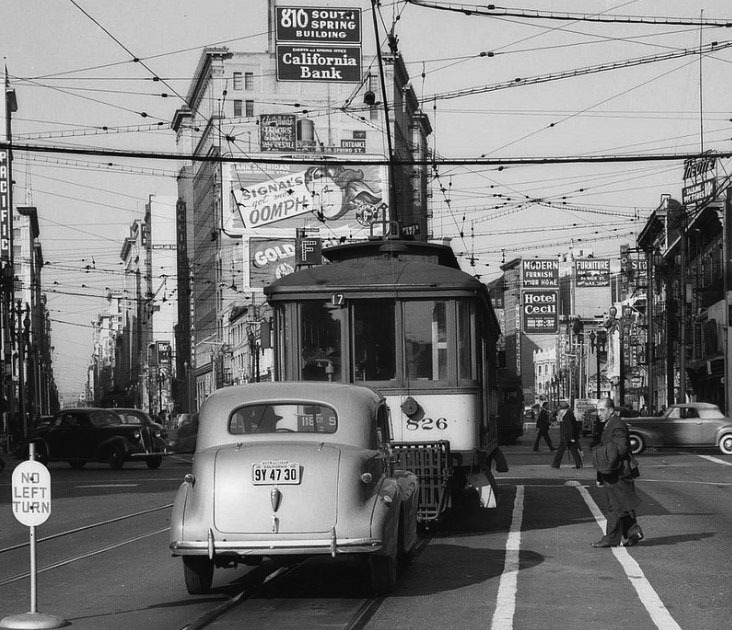 (1938)^^ - Looking north at the point at which Main Street and Spring Street separate as LARy trolley cars and autos clutter the street. Note the island on the right. It enabled passengers to board the streetcars more safely. The Los Angeles Railway (LARy), was a system of streetcars in Los Angeles between 1895 and 1945. It operated on 3 foot, 6 inch (1,067 mm) narrow-gauge tracks and connected the city center to neighborhoods in about a six-mile radius of downtown. There were about 642 miles of track at its peak in 1924. The system was informally known as the “Yellow Cars,” similar to the Pacific Electric Railway’s “Red Cars” which served more outlying areas. (1939)^^ - Main Street looking north at Ninth Street. Signs for 810 South Spring Street, Hotel Hampshire, Hotel Cecil, Hotel Chandler can be seen. 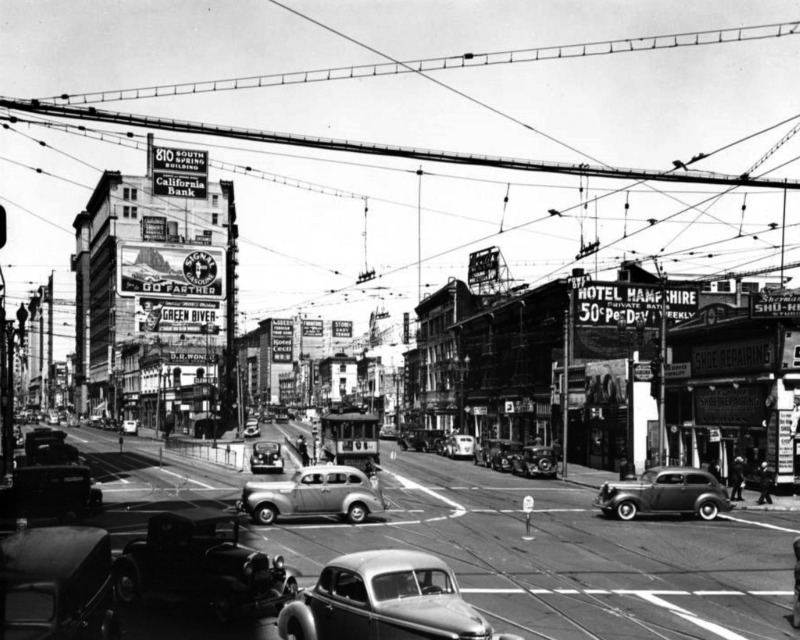 (1939)^* – View looking north on Main Street at 9th and Spring Streets. The 810 South Spring Building is straight ahead with the Hotel Cecil on the right. In the foreground can be seen a car closely following a streetcar as several pedestrians are in the middle of the intersection. In the background is Signal's "oomph" billboard with the lady herself, Ann Sheridan. Note how crowded the sky is with wires here. 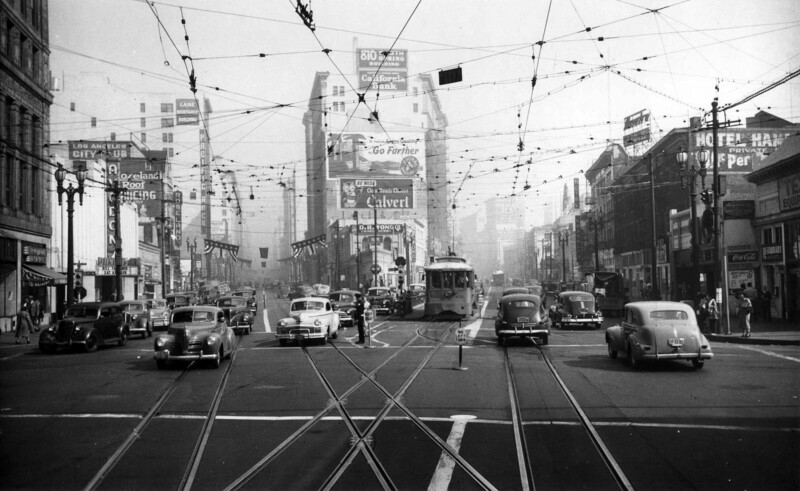 (1948)**^ - Intersection of Main, Spring, and 9th streets looking north in downtown Los Angeles. A traffic officer can be seen standing in the middle of the busy intersection. 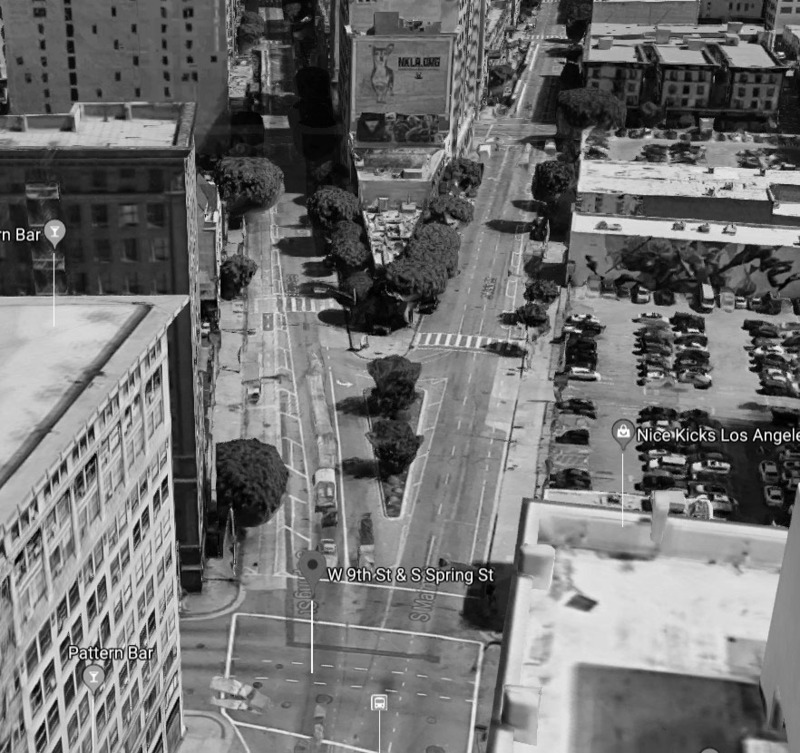 This intersection had so much potential to become an iconic public space in LA, just as Latham Square is in Oakland, or Times Square is in Manhattan. But….that never materialized. In the above shot taken on May 23, 1950, Los Angeles Transit Lines car no. 1293 heads south on Main Street working the 8 line. Waiting to make to right turn from Spring St, onto 9th is LATL car no. 1307 working the N line. In the distance, a PE car on the Watts-Sierra Vista line can be seen heading north on Main St. Soon, the N and Sierra Vista lines would be no more. The streetcar system was sold by Huntington’s estate in 1945 to National City Lines and renamed Los Angeles Transit Lines. National City Lines was already under scrutiny for the practice of purchasing streetcar lines and replacing them with buses. In a rare reversal, National City Lines actually invested not only in improved rail lines, but electric trolley buses as well, with the first group of 40 ACF-Brill coaches having been ordered by Oakland’s Key System, which itself was purchased by National City Lines who transferred the coaches to Los Angeles. 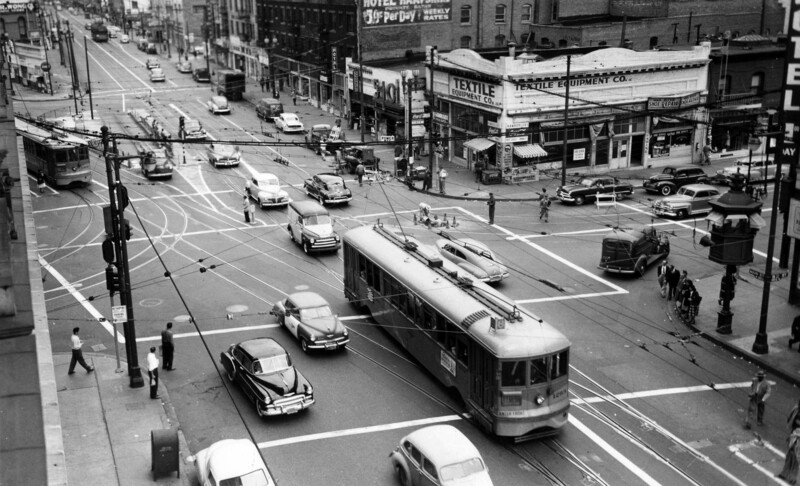 The system slowly morphed into a bus system over the years until the last streetcar ran in 1963. The last streetcar lines of the Yellow Cars were taken over by a government agency, the Los Angeles Metropolitan Transit Authority (not to be confused with the current Los Angeles County Metropolitan Transportation Authority) in 1958. 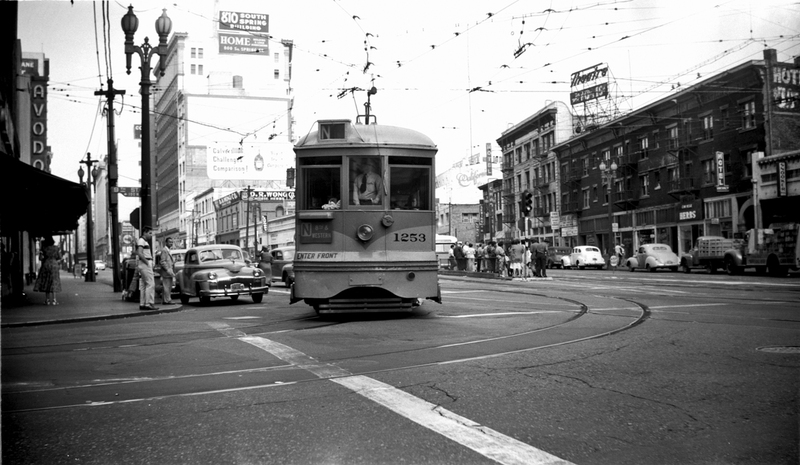 The agency removed the remaining five streetcar lines on March 30, 1963. (1966)* - View looking north from 9th Street at the Main & Spring Street intersection showing an MTA bus where streetcars used to stop. (2019)^.^ – Looking down at the intersection of Main, Spring, and 9th streets. Click HERE to see contemporary street view. 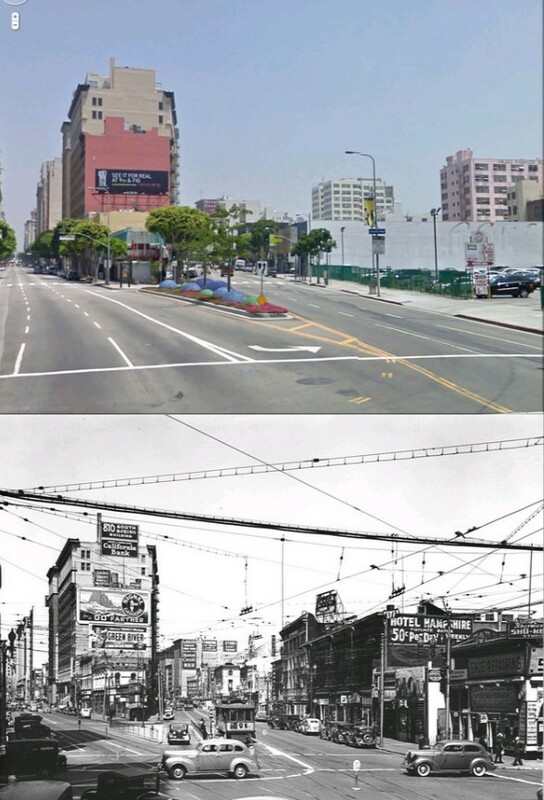 (1939) vs. (2010)^.^ – Intersection of Main, Spring, and 9th Streets.